What is the best way to waterproof a shower or bathtub before tiling? This is one of the most highly debated topics on bathroom remodeling. Today, I’m tackling it head on!! …all of which are awesome. If you’re planning to remodel your bathroom you should check this out. What’s the one thing homeowners hate in their bathroom? Hint: it’s something you can eat yet probably won’t. Hey, cheese is a form of mold…I think. 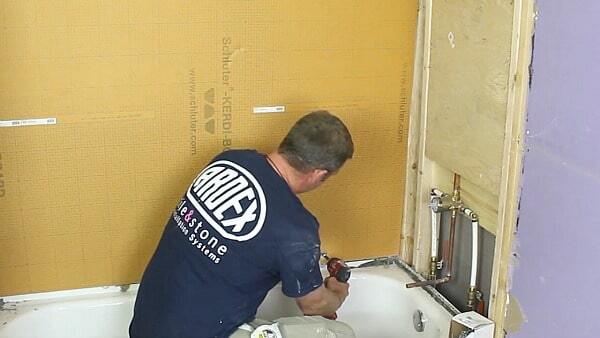 Before you start a tiled shower or tub you need to install the right wall. One that will be 100% waterproof and support the weight of tile. Let’s discuss each one and at the end I have a cool surprise. Should you lay cement board on the tub deck or above the tub lip? Our suggestion is to hang cement board above the tub lip. Your tile will look better. If you position the cement board over the tub lip, it will bow out. When you hang the tile it will also bow out. Lay scrap pieces of wood on the tub deck to support the cement board. The wood should help raise the cement board above the tub lip. Then mark the niche location on the cement board. 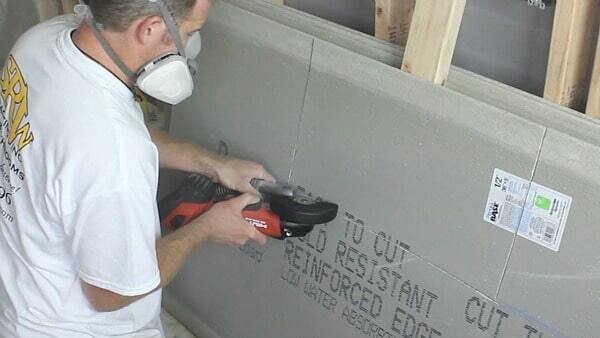 Cut cement board with either an angle grinder, carbide tipped knife, or utility knife. If you use an angle grinder we recommend equipping it with a tile blade like this one (this is an Amazon affiliate link..so thanks if you use it). Furthermore, when hanging cement board use only alkali resistant screws. Other screws will corrode, especially drywall screws. Also, make the cement board flush, or as much as possible, to the ceiling. How do you cut tub spout and mixing valve holes? Steve uses a paddle bit to cut a hole for the tub spout and shower head arm. And a 3 inch hole saw for the mixing valve. Finally, what’s the ONE mistake some homeowners make with cement board? Cement board itself is not waterproof. 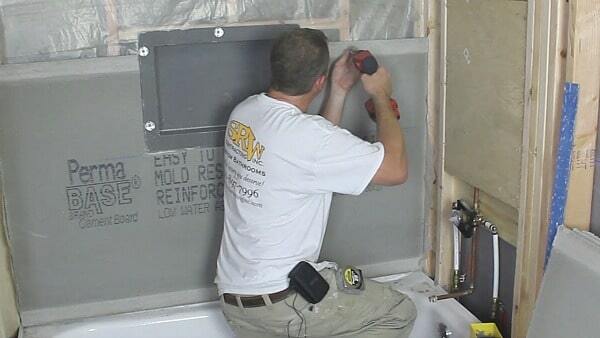 You need to apply a liquid or sheet membrane over it. 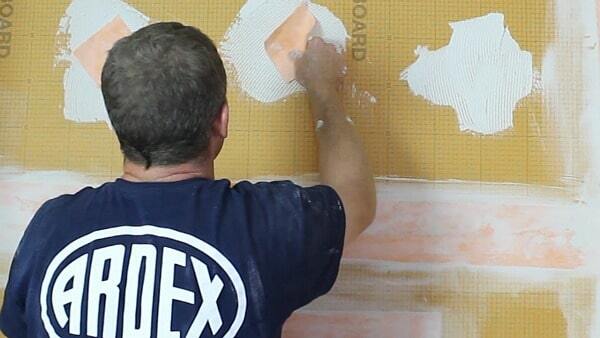 In today’s video we use Ardex 8+9. Mix it up and paint it onto the cement board. 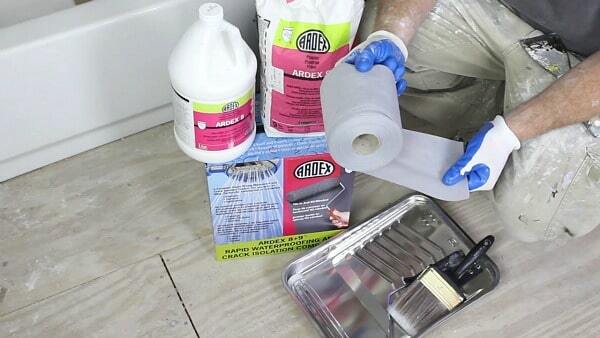 Today’s video gives you a brief overview of Ardex 8+9. We also have a complete tutorial showing step-by-step how to apply it. Cement board is cost effective, there’s no doubt. But you need to budget for a waterproofing membrane. This will add $100-$200 to the total cost. Also, cement board is heavy and a bit cumbersome to cut. PLUS dusty…which is always a pain to clean up. 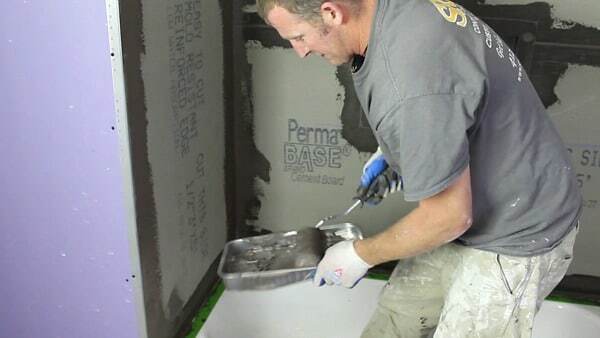 What are your options if you don’t want to use cement board? How much can you shoulder press? You need to know before installing cement board. Or at least I feel this way. One 3 x 5 foot cement board panel weighs about 25lbs. I weighed it while standing on my scale…now that’s a site! 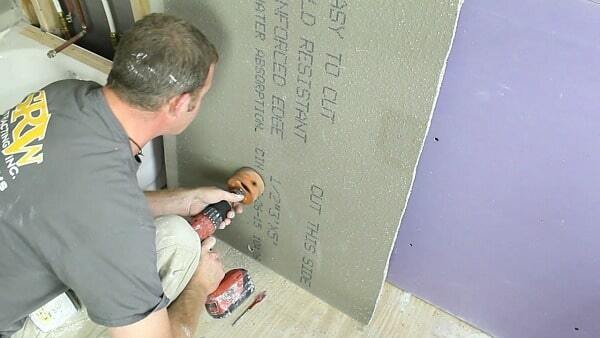 Schluter KERDI-BOARD on the other hand weighs less than 4lbs for a 48″ x 60″ sheet. This means anyone can man handle a KERDI-BOARD sheet. First things first, take a level and make sure your studs are plumb and level. Foam boards like KERDI-BOARD need a plumb stud wall. Otherwise they will bow out and this, as I said earlier, will affect your tile job. This should be done for for cement board as well. Also, we suggest mounting the KERDI-BOARD above the tub lip. 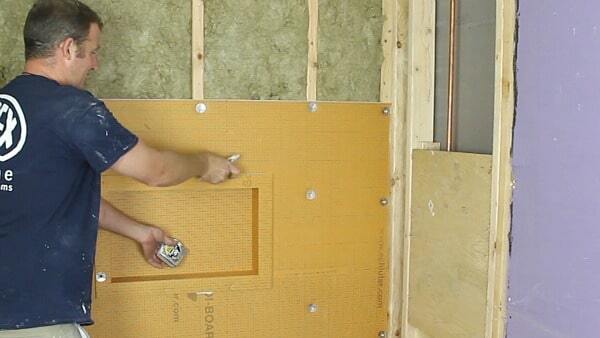 Install KERDI-BOARD using Schluter’s screws and washers. 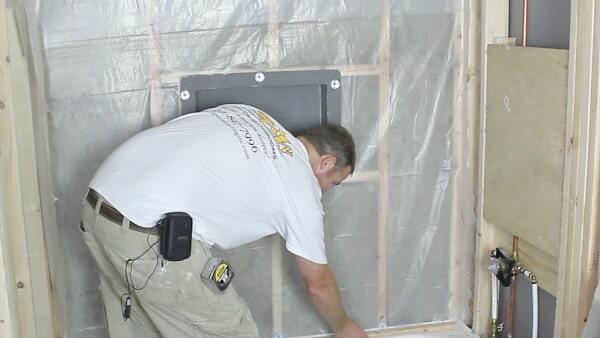 If you’re thinking of getting a niche, Schluter makes great prefabricated ones. 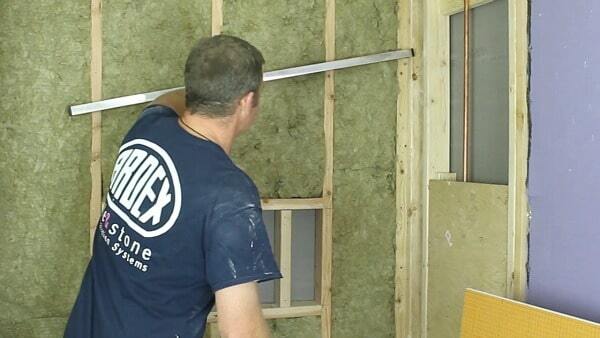 We show you how to install it in the video…it’s way easier than building one. We like making KERDI-BOARDs flush with the ceiling. 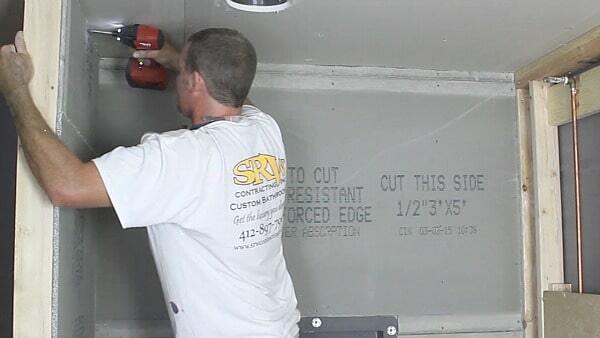 All screws, washers, and seams need to be covered with Schluter KERDI-BAND. 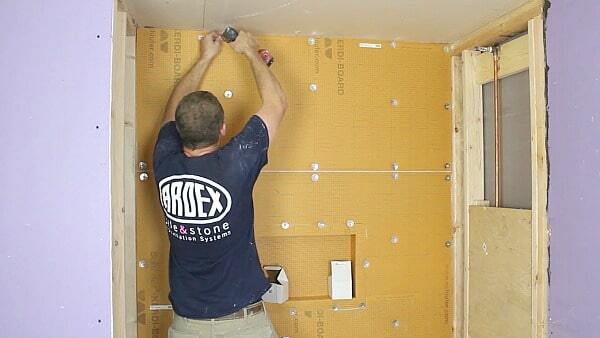 Schluter has special recommendations for the tub to KERDI-BOARD joint. Fill that in with KERDI-FIX and apply unmodified thinset to the KERDI-BOARD. Then embed your KERDI-BAND in both and smooth it out. This ensures a waterproof seal between the tub and KERDI-BOARD. KERDI-BOARD is great because it’s light and easy to install. If you think it’s simpler than cement board you’re right. 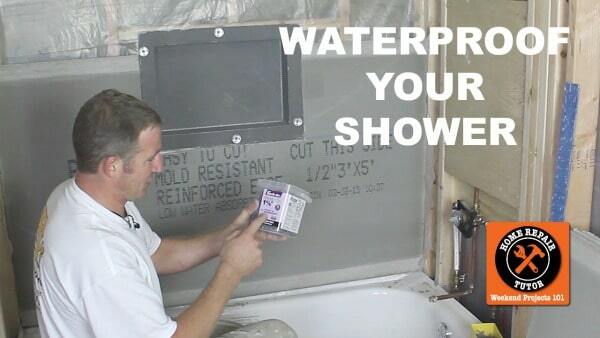 The third method for waterproofing a shower is the easiest of the three. Check out the video for the scoop on wedi and to learn the other two methods. 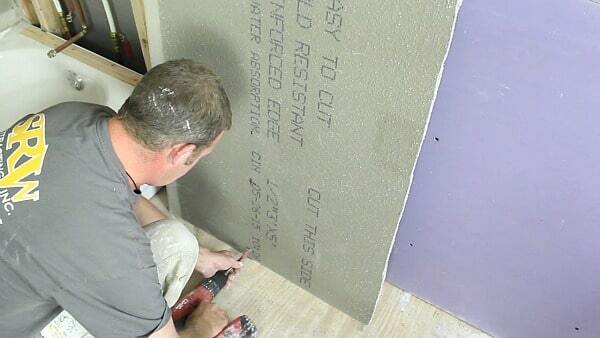 Our tutorials on wedi and KERDI-BOARD are invaluable if you want to use these backer boards. I think I would use the Kerdi. Reason? Because there are lines on it for easy and straight cutting. I also like the tape/band use over the seams and fasteners. KERDI is a great options Susan. The boards come in all different dimensions, too. You can get 1/2 inch, 1 inch, etc. K.I.S.S. Kerdi-Board gets my vote because it appears to have less steps, tools, and materials involved to get the job done, ergo less mishaps and frustrations for a female going solo on a project. KISS is a great mantra to live by. You’re right Nancy, I think Schluter has thought of ever possible mishap that could happen and accounted for it. PLUS, their tech support is awesome…they always answer and always have great answers. If I was as skilled as you, I would use method 1, otherwise I would use method 2 and even that one would be a big challenge for me. KERDI and Wedi are super straight forward, I bet you could do it Norman. Once you plan the tub or shower surround, putting it together isn’t all that bad. Thanks Bob for your tip, I can totally understand your position. For a DIYer it would be tough to get plumb walls with mudding. That’s why I recommend shimming them or sistering then attaching KERDI, Wedi or cement board. Plus, the KERDI and Wedi provide a great waterproofed wall. Cement boards looks like the most durable? In a case where any of the three options are doabl, which one would you recommend the most? Personally I love KERDI or Wedi. They’re a bit more expensive but easier to install and no extra waterproofing is needed on the surface, unlike with cement board. I live in the Chicago area. I have used cement board, Kerdi and Hardi-backer board. With preference going to Kerdi; but I have not seen Wedi brand boards anywhere. Wedi is pretty awesome, it’s similar to KERDI but slightly different. You can use their sealant for all the corners, seams, and screws. Plus, after 2 hours you can start to tile. So if you’re a contractor this is a HUGE upside…time. Another option you should be aware of is Finpan’s Propanel. It is used just like any other inherently waterproof foam core board like Wedi, etc. It isn’t quite as stiff as Wedi so depending on your install you may wish to use extra blocking behind it – we simply spaced the studs at 12″ instead of 16″. This worked out very well for a very large format custom travertine shower with 9′ ceilings and angled walls. I’ll have to check that out Jeff, what’s the price for the Propanel? Wondering if it’s comparable to KERDI and Wedi. I do like the stiffness of the KERDI and Wedi, in terms of a foam board. Wedi is a bit stiffer than the KERDI overall but that doesn’t affect the performance. Foam boards are easier to use for sure, cement board was a great option but I’d stick with the foam all day. 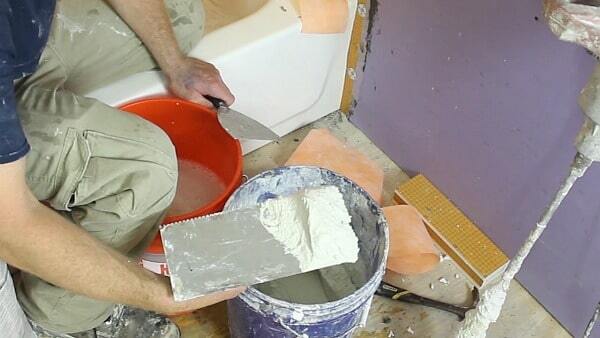 Never used anything but cement board for tile or stone. Is foam board same for heavy stone walls? I am remodeling a bathroom. It has plastic behind the cement board. Can I also use Red Gard on top of the cement board or would that trap moisture? Also, should the gap between the cement board and lip of the tub be caulked with silicone? If so, should there be weep holes in it. Thanks for the help. I helped a guy several times and he just put up purple sheet rock then used thin set to attach kurdi membrane over entire sheetrock with 6 inch overlap. IS THIS A GOOD PRACTICE? The Kerdi board looks like relatively easy installation; however, not sure if it is as strong as cement board for backing of tile. It’s strong and only requires 16″ on-center stud spacing. Btw, cement board needs that spacing, too. 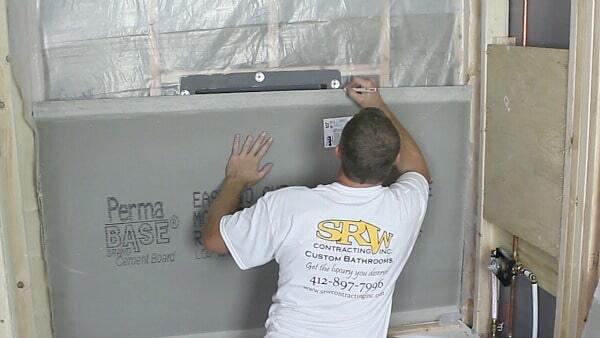 Foam backer boards are way easier to cut and install than cement board, and they don’t need an extra liquid waterproofing. Just something to consider. Is it ok to use something like roofing tar to waterproof a shower bottom. They did it in another apartment and I do not want that method used in my apartment.